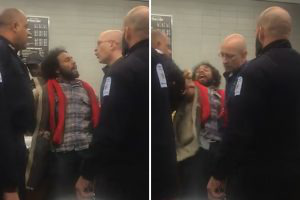 Barnard College administrators have announced that the six college public safety officers who were involved in a physical confrontation of Columbia University student Alexander McNab have been put on paid administrative leave pending the ongoing investigation. On the night of Thursday, April 15, officers followed McNab, who is Black, into the Milstein Center for Teaching and Learning claiming that he did not show his Columbia ID at the Barnard gates. Additional officers were called to the scene and the confrontation escalated when two officers physically held him against a counter in Peet’s Coffee, according to the Columbia Spectator. The officers allegedly confiscated his McNab’s ID, claiming they needed to verify that he was a current Columbia student. Following the incident, both Columbia and Barnard held listening sessions where students voiced their concerns about what happened to administrators. That evening, the deans of the School of Engineering and Applied Science, General Studies and Columbia College released a joint statement about anti-Black racism and highlighting the need for crucial response and discussion. In addition, Barnard also released a statement announcing that it had placed the six officers on leave, and is in the process of hiring an independent investigator to evaluate the incident. The statement did not mention anti-Blackness.